By Dan Ambrose: While WBA “regular” welterweight champion Keith Thurman (26-0, 22 KOs) has no interest in facing unbeaten #8 WBA contender Errol Spence (17-0, 14 KOs), because he doesn’t see him as experienced or popular enough to face, Thurman is being ignored in the same way by the more experienced and popular Amir Khan, who Thurman badly wants to fight. One of the excuses for why Thurman isn’t fighting Spence is because a fight against Khan would be a much bigger deal for Thurman than a match-up against Spence. The problem is there isn’t a fight for Thurman against Khan right now, and it doesn’t look like there’s going to be one happening any time soon. Thurman sounds desperate for the Khan fight. It would be better for Thurman to take the fight that’s there for him against Spence rather than wasting his time and energy waiting on fights that aren’t going to happen against the more experienced Khan or Floyd Mayweather Jr. Right now, Thurman needs to increase his popularity because his fights against Luis Collazo, Diego Chaves, Leonard Bundu, Robert Guerrero and Jesus Soto Karass has failed to increase Thurman’s popularity enough for him to get the bigger fights that he wants to get. Thurman needs to prove that he can beat guys like Spence to show that he’s for real and that he deserves the bigger fights against better known fighters like Khan and Mayweather. If Thurman is only going to take on the easy marks like Bundu, Guerrero, Chavez and Collazo, then he probably will never get Khan or Mayweather in the ring. Thurman will just be another Vyachaslev Senchenko type champion, who holds down a title beating obscure and weaker fighters, but who never rises up enough to get the bigger fights. The biggest fight Senchenko got during his time as the WBA champion was against Paulie Malignaggi. “You can talk about how he did that to Collazo and Collazo hit me with a body shot but Diaz hit him on the chin and dropped him. 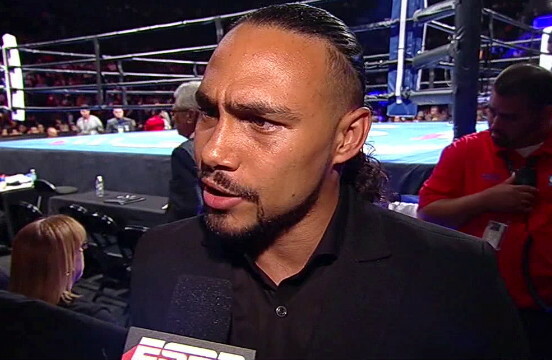 Diaz didn’t touch me with anything and I made him retire,” Thurman said. Thurman was badly hurt by a body shot from Collazo recently and almost knocked out. Khan had an easy time beating Collazo in 2014 in a very one-sided match. Khan did struggle to defeat Julio Diaz in 2013, but he still got the victory. Thurman easily beat Diaz. However, the main thing here isn’t so much the guys that Thurman has or hasn’t fought during his career. The main thing is he’s just not a really popular fighter yet, and for that reason a fight between him and Khan wouldn’t bring in a lot of money to make it worthwhile for Khan to take the fight. The fight could be big in the future if Thurman beats guys like Errol Spence, Shawn Porter, Kell Brook and Marcos Maidana to show that he’s a good fighter. But right now, Thurman hasn’t fought enough big names to get the bigger fights that he wants.